I was resisting jumping into the Mini Mini Swap on Instagram until Lydia posted the pile of adorable mini minis that she had created. I just loved the Alison Glass star that she made (top middle), and offered to swap with her. Lydia's favorite colors are raspberry, mango, aqua and yellow. It took me a few days to formulate a plan, but I decided on a raspberry-colored half-sized Patchwork City block for the mini. Mine measures 4 1/2" square. I paper pieced the roof/sky sections of the mini so I wouldn't have to deal with tiny templates and the rectangular pieces were simply machine pieced. I went with crosshatch quilting, echoing the angle of the roof lines. 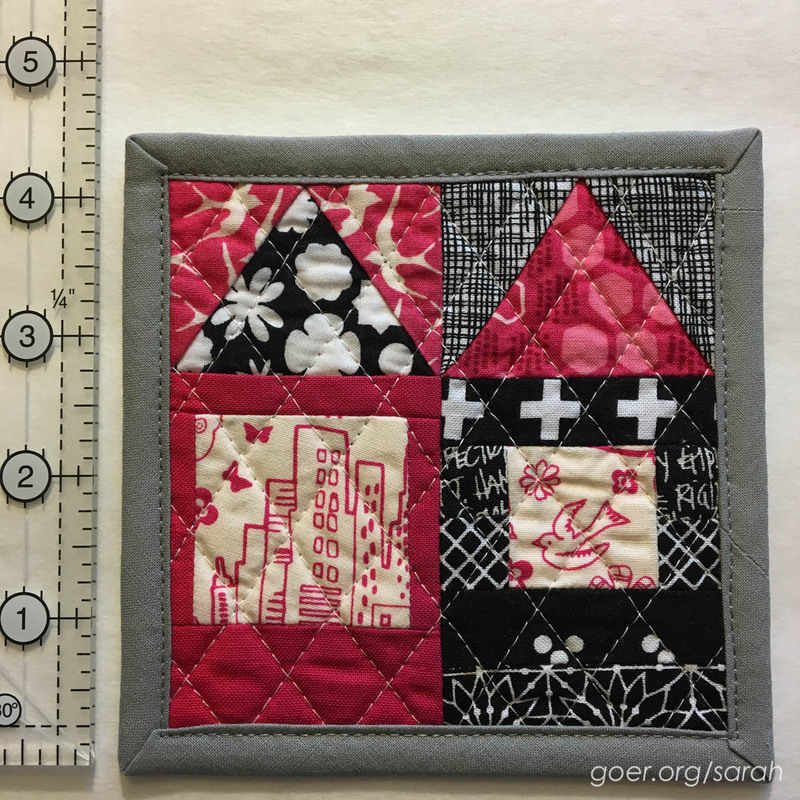 I used Quilting Jetgirl's tutorial for mini mini binding. This was a lot of fun to make and I think I'll make some more using the Patchwork City patterns. I hope people are still swapping mini minis on IG once I get to them. Posted in Quilting. 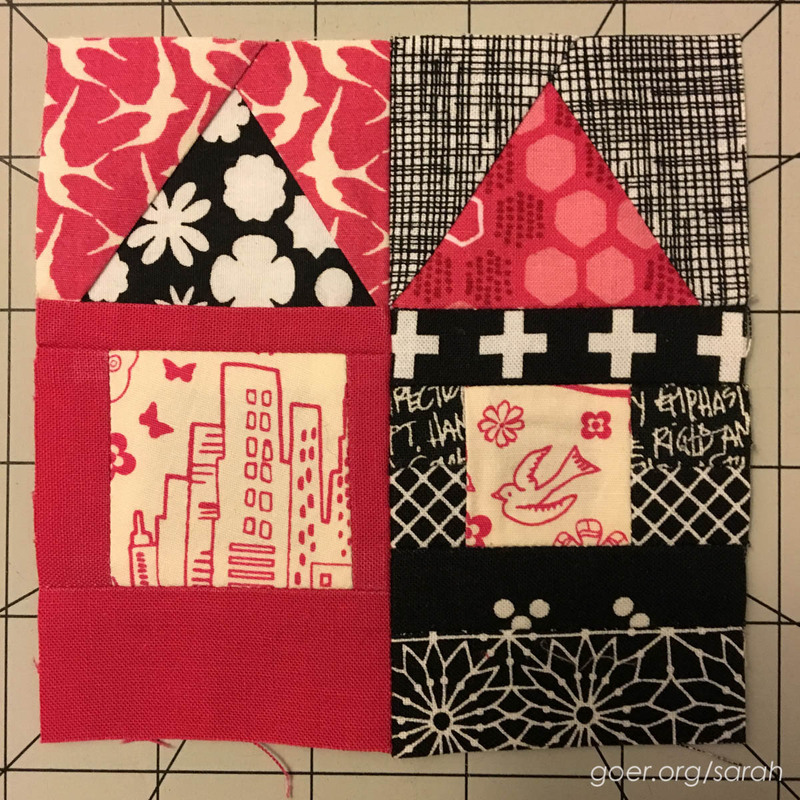 Tags: finished quilt, mini mini quilt, Patchwork City, swaps on December 6, 2015 by sarah. My goodness, Sarah, you have been busy lately! I have feeling you are always busy. 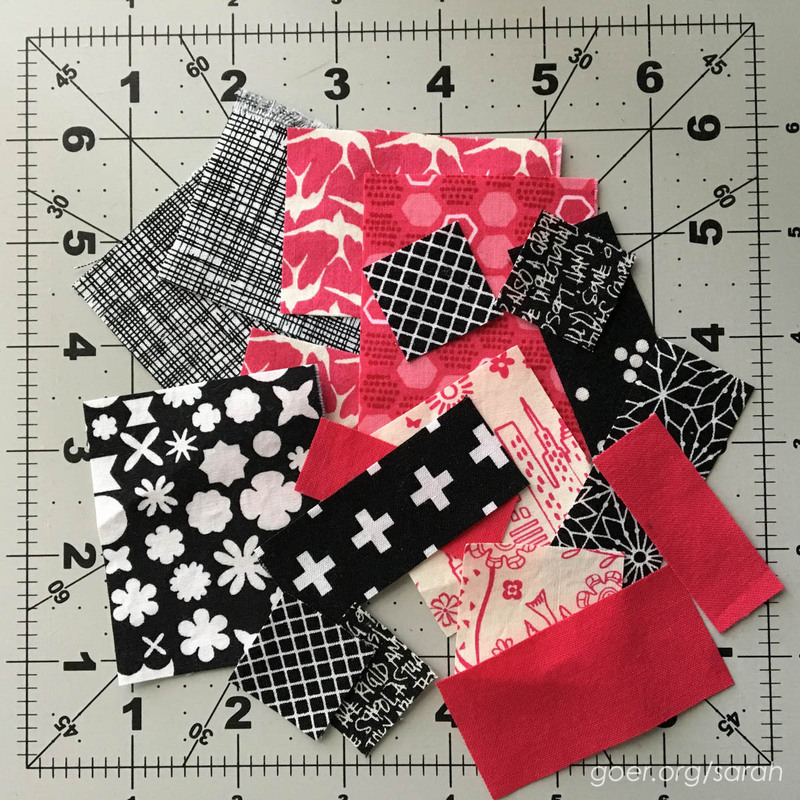 I love this tiny treasure and the idea of half-sizing a Patchwork City block and making it into a mini mini quilt. It has your stamp on it, even though it is only 4 1/2" square. You continue to inspire me! I believe that the swapping is still going strong; your first mini mini turned out beautifully! The one I made is 4 1/2" x 4 1/2". Some people are making them as small as around 3" x 3". I think swapping continues. Yours is great. Love the fabrics you chose. These are so sweet! Like little doll quilts. For teeny tiny dolls. ;-) They're a lot of fun to make. I love this idea! I'm not enough of a fan of all the PC blocks to make the quilt. Making a mini mini is a great solution! The mini minis I've made of the PC blocks were so fast and easy compared to the big project that is taking me forever. Ironically, I'm not a real fan of samplers, but I really do like the look of the whole PC quilt. Perhaps it's the rainbow color palette, or that each unit has a similar design with the three smaller sections. Thanks for visiting, Sue.